Replace Studio Business Edition is a sister program to Funduc Software's Replace Studio Pro. Like Replace Studio Pro, Replace Studio Business Edition searches through text-based files and can also make replacements. Also like Replace Studio Pro, the 'Business Edition' can now do seaches on .pdf files (search-only). Search/replacements can be done on .docx, .xlsx, .pptx, and 'Open Office' files if you want (see documentation for instructions). The program can search/replace in subdirectories and ZIP files, it can perform case sensitive searching, it can match on 'whole words' or partial words, and it can ignore 'whitespace' or not. Advanced 'file masks' and 'file filters' can be used to tune which files & folders are to be processed. Replace Studio Business Edition is not intended for 'business' customers only. The word 'business' in the program title is used because the program is primarily oriented towards 'scripted' search (& replace) tasks that are passed to the program on the command line. One example might be a standardized search of log files that is used to generate an output report of interest. Because these types of fixed tasks are more common in a corporate or business setting, we chose to name the program 'Business Edition'. Replace Studio Business Edition does have a graphical user interface (see below). The GUI is used to create 'script' files that contain the search/replace string(s), path(s) & file mask(s) to search, and other program options for that script. Scripts can then be recalled and run via the GUI if you like. A built-in context viewer presents search results in the context of the found string. The context viewer can also be used to manually edit the file containing a 'search hit'. Alternatively, you can launch the viewer/editor of your choice to open that file. The main window also supports drag n drop from Explorer into the 'Path/Mask' field and you can drag n drop files in the Search Results list into Explorer or an external editor that supports drag n drop. Once a script has been created and tested you can load and run that script via the windows command line or in a .bat file. /r or /R - Specify this switch to perform a replacement. In the above the /r switch tells the program to perform a replace and /u disables the program interface. 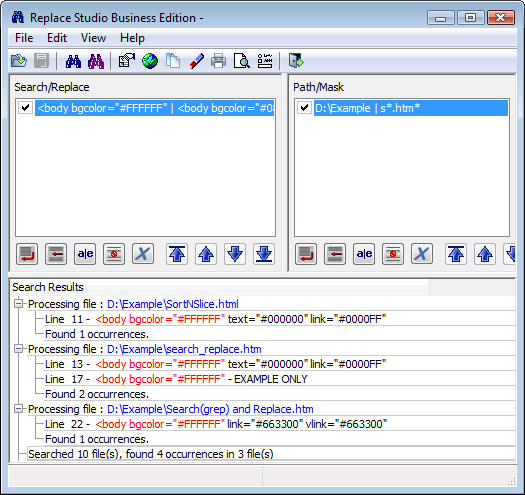 Replace Studio Business Edition can load & read .srs Search and Replace scripts. Upon saving, the converted script is named with .srx for the name extension and the .srs script is left unchanged. A conversion utility is also available. See srxConvert for more information. Replace Studio Business Edition runs on Windows Vista, Windows 7, Windows 8, & Windows 10. Separate 32-bit and 64-bit versions are available via the downloads below. If you have a 64-bit operating system you must use the 64-bit version. See a feature matrix for a brief comparison of our three windows grep utilities - Replace Studio Pro, Replace Studio Business Edition, and Search and Replace. Note for Search and Replace customers: Installing either of the Replace Studio utilities will not interfere with your existing Search and Replace installation. The three utilities are 100% independent of each other. Note: As of v 7.8 of Replace Studio Business Edition the overall program display font face & size can be adjusted via a special program setting. A standalone configuration utility - FSConfig - is available to make it easier to make adjust the setting. See FSConfig or below for download information. SetupRSBE.exe .5 MB - Self-installing version for 32-bit Windows. See Install & Uninstall Information for guidance about installation and removal. Download this to a temporary directory and run 'setuprsbe.exe' to install. SetupRSBE64.exe 2.9 MB - Self-installing version for 64-bit Windows (x64). See Install & Uninstall Information for guidance about installation and removal. Download this to a temporary directory and run 'setuprsbe64.exe' to install. Purchase Information - See information on pricing & purchase options. setupfsconfig.exe (1.1 MB) - This is the self-installing version of FSConfig - Funduc Software Configuration Utility for Replace Studio Pro and Business Editions. See Install & Uninstall Information for guidance about installation and removal. Download to a temporary directory and run 'setupfsconfig.exe' to install. The program is largely self-explanatory. A shortcut is created to usage documentation. FSConfig.zip (0.8 MB) - This the a .zip version of FSConfig. To install, download this to a temporary directory and UnZip into the subdirectory of your choice. See 'Install.txt' and 'Readme.txt' in the zip for more information about install/uninstall and usage information. srxConvert.zip (0.61 MB) - a free utility to convert Search and Replace .srs scripts to Replace Studio .srx Favorites/scripts. To install, download 'srxConvert.zip' and unzip the contents to the folder of your choice. See 'ReadMe.txt' and 'Install.txt' in the zip for install and uninstall and usage information. See the srxConvert page for more information.